踏入30歲，80後大男孩的生活，吃喝玩樂，交流攝影，旅遊，戶外等生活體驗。A blog of a boy never grow up. 當時我選擇Yahoo Blog為平台，其中一個原因是Yahoo是少有能在中國自由使用的博客平台，現在搬家了，Blogger雖然有很多很好的功能，但就不能在中國大陸使用，身在中國，有想寫blog，怎樣好？I started my blog in Yahoo Blog platform because it is one of the seldom blog site permitted to be used in China.Change to Blogger does bring with good features but also headache, it can't be accessed in China. 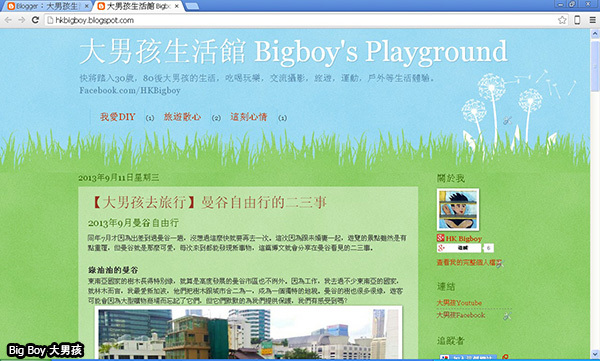 So how to blog in China? 如果想在PC使用Blogger，自由門這個軟件可能可以幫到您，下載後只需要打開軟件，它就會自動搜尋服務器。Freegate is a free software that helps you to connect banned websites in China. 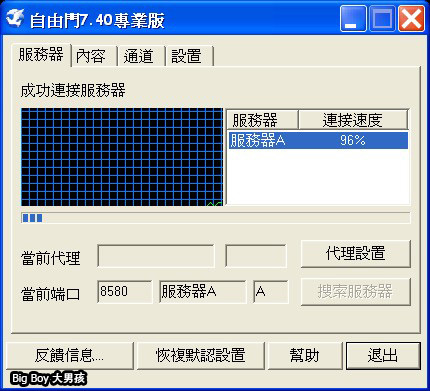 找到適當的服務器後，連線後就會出現這個畫面。When it found a right server, it connects automatically and you are ready to go! 輕輕鬆松就可以繼續發博文了，雖然不是每一次都能夠成功，但算是非常可用。Good to see my blog again in Shanghai. It doesn't work every time. But it is kinda stable. 如果想在手機上使用Blogger App發文，或者觀看博客，Hideninja這個app是一個不錯的選擇，在Play Store搜尋"Hideninja"，最好在出發前安裝好，在大陸比較能找。If you want to access Blogger by Android smartphone, go get Hideninja in Play Store. Better get it before you depart to China. 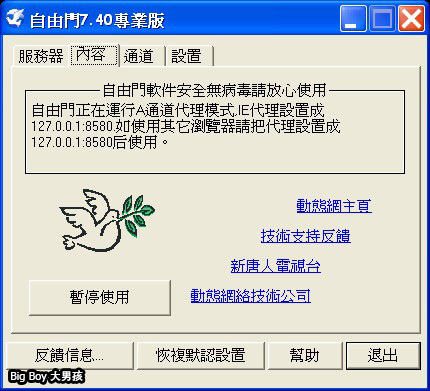 下載後打開，好有趣的一個忍者。它會顯示您身處的位置。It shows where you are the IP information. 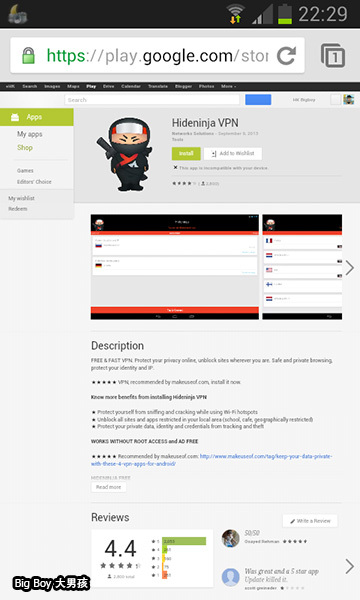 點擊下方"Hideninja moves you to"的位置，您可以選擇VPN的地址，免費版有4個可以使用。Click on "Hideninja moves you to", select 1 of the 4 free server loaction. 最後按"Tap to Connect"，畫面變成為綠色，代表您連接好了，打開blogger的App，繼續發文吧。Click on "Tap to Connect" and the screen turns green. You are a free man now. 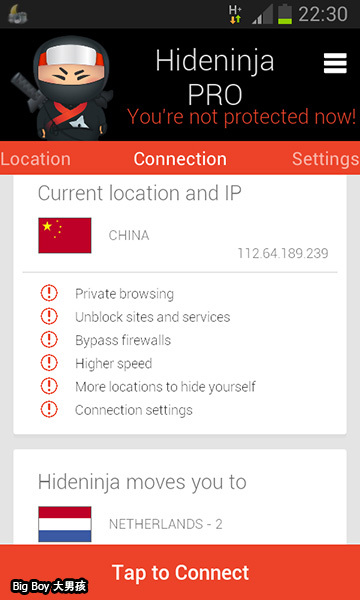 Hideninja這個App也不是百分之一百可用，但總比要回港才能發文方便多了。Like Freegate it is not 100% working all the time. But it is already a very handy app for traveler in China.